Image credit: Marcus. This image is published under this creative commons license. If you have ever been to Kanyakumari, you’d have noticed the huge array of windmills that greet you on the way. It’s a spectacular scene with so many windmills lined up on either side of the national highway. Windmills like that are huge and they produce electricity in large quantities. Of course, they are uber-expensive and take a lot of space. These factors make them inviable to be installed within cities. But, there is another category of windmills called micro wind turbines or micro-generation wind turbines. Wind has a lot of kinetic energy stored in it. This kinetic energy/wind energy can be harnessed to our advantage (think: wind powered sail boats). With the advent of motors and generators, we now have windmills that can generate electricity as their blades rotate. 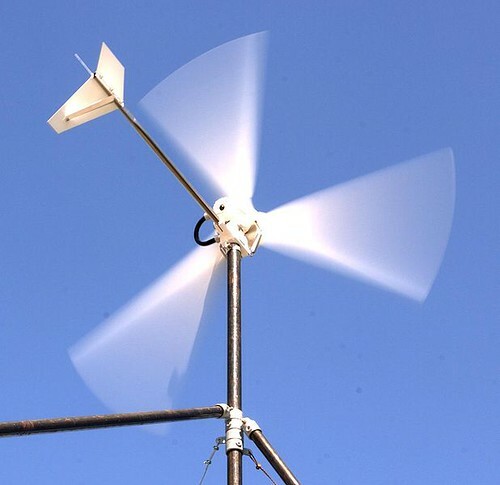 Micro wind turbines are small windmills that can be installed on roof tops using small towers, open-spaces like parks, etc. It seems they should be installed at least 6 m higher than surrounding obstacles (if any). As you can see, micro wind turbines can’t really power all the systems in a house even if the house is located in a windy region. But, it can be a good back-up power source during power cuts, etc. A lot of people buy inverters these days, and instead of charging the batteries using electricity, they might want use micro wind turbines or solar panels. There are hybrid systems that combine both wind turbines and solar panels and provide a combined power output. These systems may be more reliable and might generate a considerable amount of power. In countries like US and UK, Government subsidies and tax-credits are available for either buying these systems or for generating power by such systems (feed-in tariffs). The Indian Government should also bring such incentives so that people can generate some power by themselves (at least enough power to offset power-cuts). Of course there are limitations to micro wind turbines. Their cost (entry-level systems may cost around $1000 USD) is quite high for the amount of electricity they generate. Older (unmaintained systems) may produce some noise. We need to buy batteries (huge cost) to store the electricity as we can’t export electricity to the power grid in India. We need to buy inverters (to convert DC to AC) and charge controllers additionally. Birds may get hurt (don’t worry about crows though – they are too clever!). It’s placed outside, so there is a chance of burglary. It seems, larger wind mills are much more efficient than the micro wind turbines. But for the sheer thrill of being able to generate electricity (to offset power-cuts) and showing off to neighbors/guests, some people might opt for it. Wind is a renewable source (pollution free) and it will not get exhausted. These turbines are expected to last for 15-20 years, so it might be a good investment after all. I hope some companies will come up with innovative/inexpensive models suitable for our country. If you want some thrill and adventure, the best thing to do is to make one yourself! I came across this DIY blog post that details how to make a small wind turbine (the model is shown above and they spent around 7000 rupees to do it, it seems). I wish more college students like them take up such renewable power generation projects. Good job, guys! Wow! I like the view of large wind turbines on the way to Dindugal (if I am right), precisely on the way to PSNA Engineering College. I have worked with the company that designs such wind turbines. Engineers proudly say that its the most coolest project they’ve worked on! I have not seen the windmills near Dindugal, but I have seen many near Kanyakumari. It’s a wonderful sight because almost all of them keep rotating. And they are huge. It seems, we were able to manage this summer (in chennai) because of the electricity generated by these wind mills. Brilliant post – This is very interesting. It is very important to turn to renewable energy sources given our rapidly growing needs and the every increasing consumer base. People in Europe (where they receive very less sunlight) are enthusiastically installing solar PV panels. But, in-spite of sun shining throughout the year, we are suffering with power-cuts here! The Government should take up large scale renewable projects and people should look at installing small scale micro generation projects. It sure feels good to be in charge of your own power generation and if one is building a house, it can be included in the cost. Multistoreyed buildings can have bigger ones for back up power, for which they use generators today. The possibilties are endless. But unless someone produces them in sufficient numbers and cheaply, they might remain as a novelty, no more. Yes, mass adoption of renewable energy technologies are very critical for their success. Just imagine what mass adoption of electronic gadgets did to us, the same thing can happen to these micro generation technologies but the public should show interest in procuring them. When there is a market, automatically large energy players will get into the game and the cost will reduce due to mass production. Wow!!!! Now this is a great idea!!! If govt. subsidizes this and other clean energy resources then i am sure they will become very popular. and eventually with mass production the cost will also come down. The way run of the river hydro power plants are slowly but steadily gaining popularity because of low cost and low impact on environment, the same thing may happen to these wind mills also. It has to be economically viable and, then people will buy it for sure. Government subsidies are important, but I would rather not want to get struck with paper work or getting money from the Govt. If they can reduce the amount from our monthly energy bills for installing such technologies, we can happily pay less. That’s why the Govt should bring feed-in tariff system and start developing an intelligent power grid. I would also like to see the power generation/distribution privatized. Privatization has already started. in some of the circles distribution is already privatized. There are already some private players in generation like Adani, Tata, Lanco etc. Though transmission is not privatized much. Now govt. should speed up the process of privatization by allowing & encouraging more private companies to enter the power sector. Yes, large scale private power generation has started and the Govt. is encouraging it, which is a good thing. They are even encouraging large scale renewable energy generation. It will be great if the Govt. also encourages micro generation technologies too. It is true that solar technologies/micro wind technologies are quite expensive currently. But a lot of people can afford it even now, when you look at what they are paying for real-estate/houses, etc. For mass adoption, the price needs to come down drastically. Do continue doing and posting your DIY projects in your blog. I am sure they’ll be helpful to many people in the future. Hi Rajesh, thank you for this great info on wind turbines. The huge ones that we sometimes see are really expensive and if the area is not windy they don’t work properly. I think a lot of people are interested in solar panels, especially in countries with a lot of sun. But even in Europe, people are starting to invest in solar energy equipment. Who doesn’t want to be energy independent? Yes, cost and reliability are issues that need to be worked out for renewable technologies. But if people show interests, I am sure that technology could be scaled up/be made more economical. But for the sheer thrill of being able to generate electricity (to offset power-cuts) and showing off to neighbors/guests, some people might opt for it. R u sure? Surely wishful thinking. But don’t we also need to live in a windy area for that? What if I live in a apartment building that houses many flats? Fix it on the terrace? The upfront cost of the windmill/battery is a huge deterrent. And as you said, one must be in a windy area to install it. In apartments, the residents association should buy a few windmills and install it in the terrace so that the electricity can be shared among all during a power cut. If it’s a multi-storied apartment, then it is even better as the windmills can be installed at a greater height. Please do read the review of the documentary Windfall by Roger Ebert. Do not have the link handy now, but you can search. Hi How much power we can get in this? Rs.7000 for only turbine? You should visit the blog post linked from within the article to get more information on the turbine. 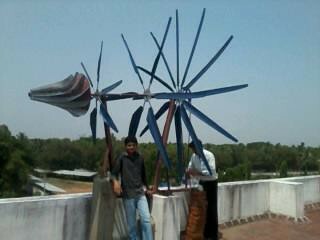 It was done as an engineering project by students, not by me.